Someone’s got a birthday coming up, so let’s just hop right into the party planning. We’re hop-timistic that your little bunny will love the pretty pastels and adorable bunny featured on our Birthday Bunny party supplies! With spring right around the corner, there’s no better time to celebrate an awesome year. 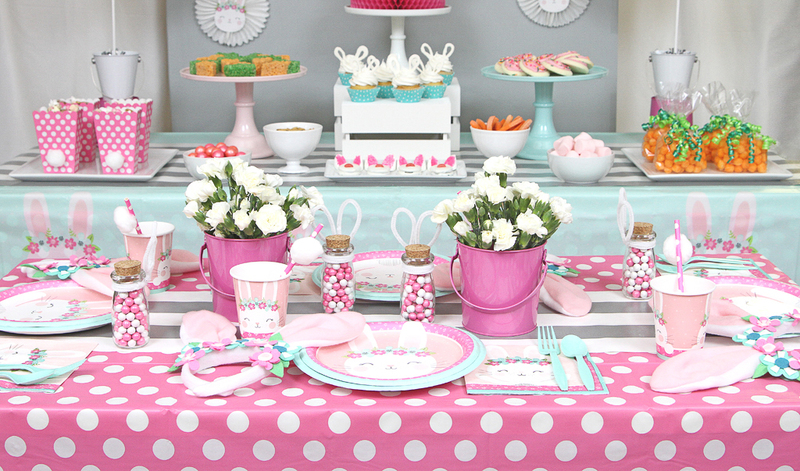 And this party theme really brings spring to life! The pretty pinks and bright blues will have your guests feeling very hoppy. They won’t carrot all when they indulge in all of your savory and sweet treats. Calories don’t count when you eat from adorable bunny plates! Luckily for you, you don’t have to just play it by ear. 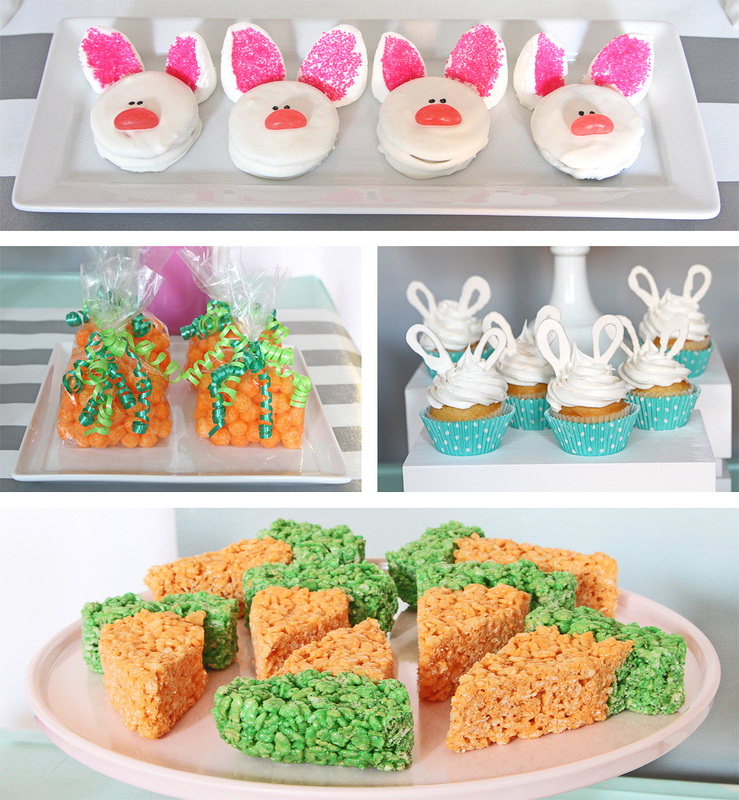 We’ve got all the tips and tricks you need to plan the perfect bunny birthday party! 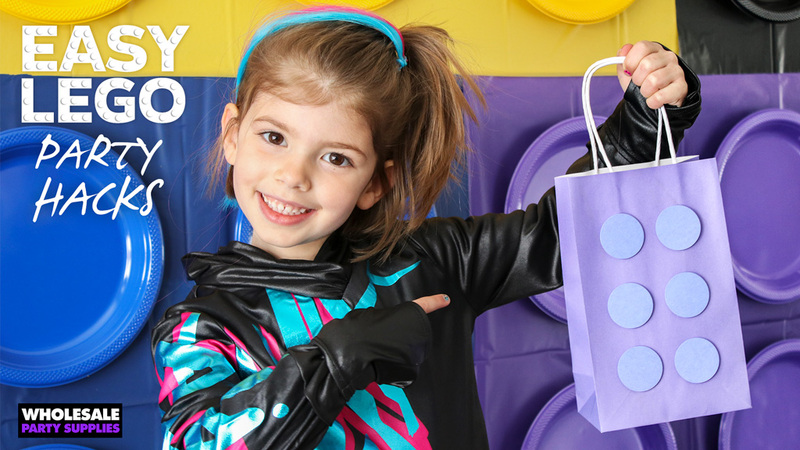 Follow along with our party ideas and your little bunny will be jumping with joy on her big day. 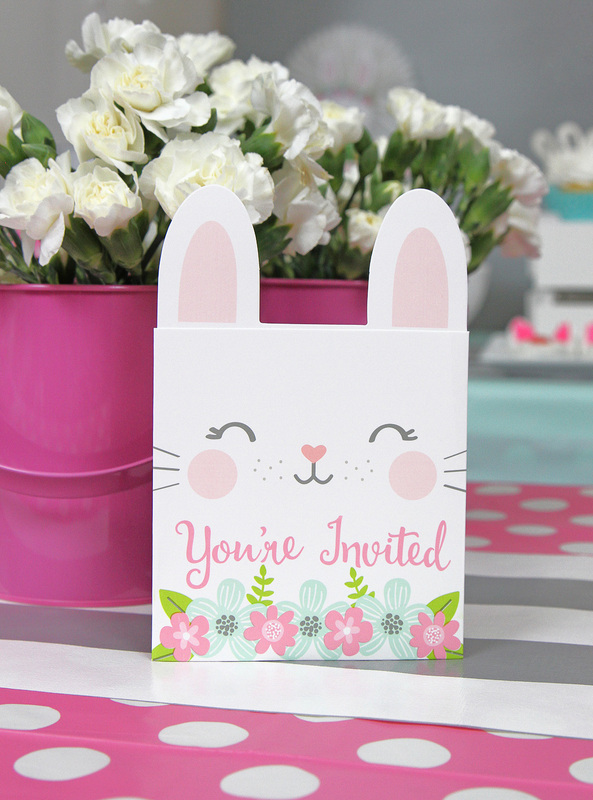 Pop these Bunny Popup Invitations into guests’ mailboxes to commence the fun even before the happy day arrives. This adorable white bunny surrounded by spring flowers will prepare your guests for all the sweetness and whimsy of this birthday get together. 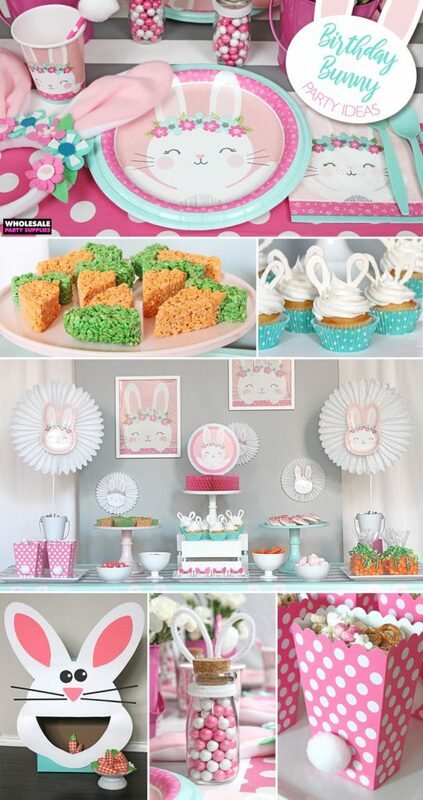 Allow the pink and teal of the bunny party accessories to pop by backing them with white and gray neutrals. 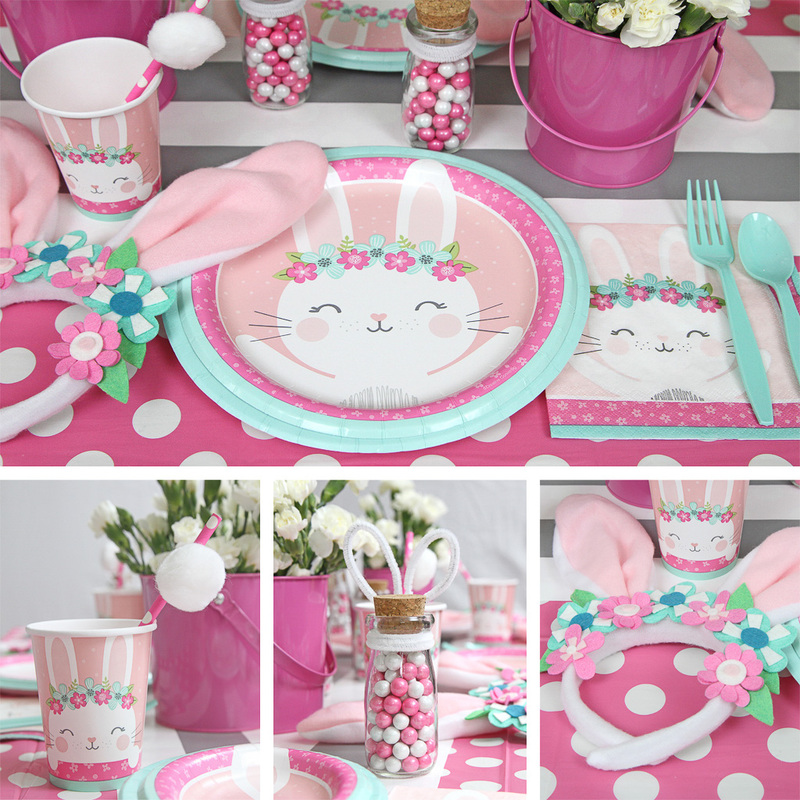 Start by layering a Birthday Bunny Plastic Tablecover over a Pink Polka Dots one … we love how the polka dots peek through and give the bunnies a freckled effect. Add a gray and white striped gift wrap runner down the center to bring the gray and white onto the table top. 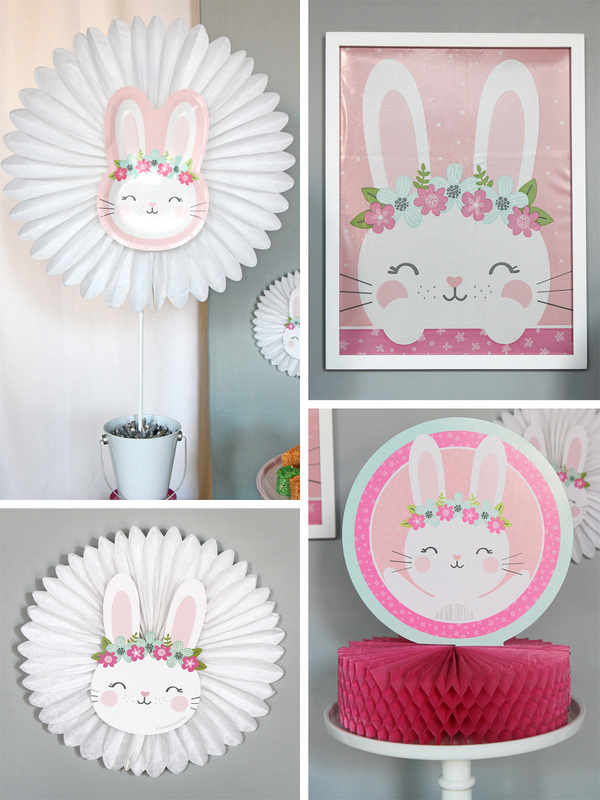 Attach Birthday Bunny Shaped Plates and Dizzy Dangler shapes to the fronts of White Tissue Fans for quick “flowers”. We adhered a few of the larger “flowers” to dowels embedded in Silver Balloon Weights to further the floral theme. 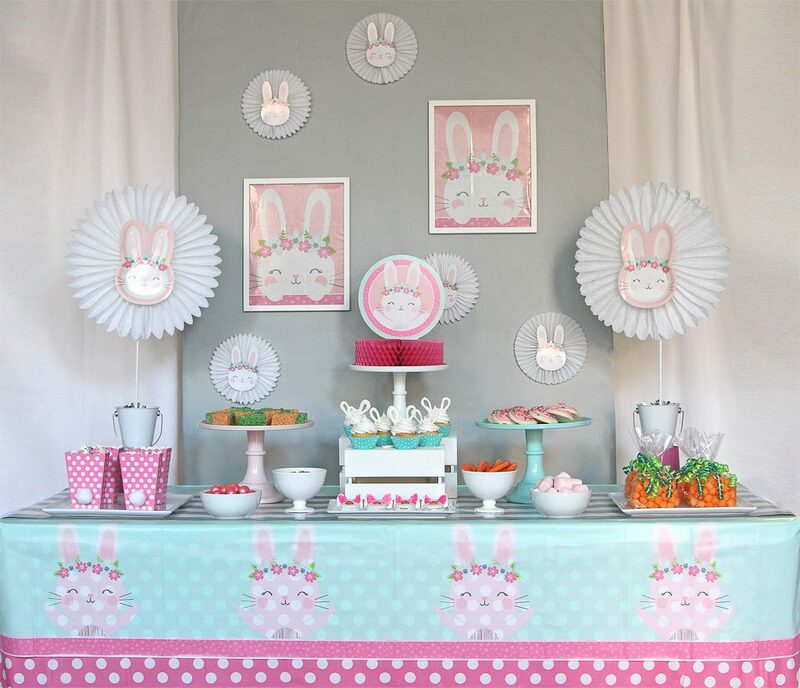 Elevate a Birthday Bunny Giant Party Banner into art by mounting the bunnies in 11×14 White Frames. Hang using monofilament. Give this Birthday Bunny Honeycomb Centerpiece more presence on the table by setting it up high on a cake stand. Set the dining table with more pink polka dots and a couple of Pink Metal Buckets filled with pom pom mum “bunny tails”. 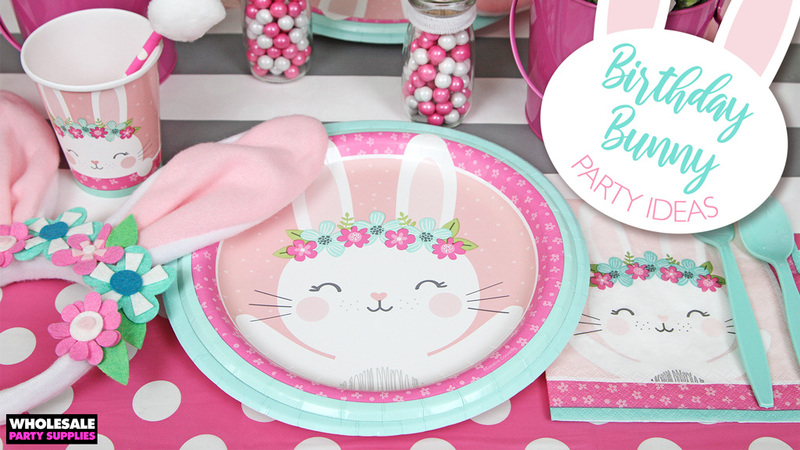 Perch Birthday Bunny 9” Dinner Plates atop Mint Dinner Plates for that on-trend layered look. A Birthday Bunny Luncheon Napkin and Mint Utensils sit aside the plates. Glue white craft pom poms to Pink Paper Straws for a bunny tail twist. Set straws in Birthday Bunny Cups so guests can sip away. Transform Glass Milk Jars into Bunny Candy Bottles by filling them with Sixlets Candy and wrapping with white pipe cleaners around the tops to mimic ears. Complete each place setting with a pair of Floral Bunny Ears to make sure no one has a bad hare day. Get the DIY tutorial HERE. Colorful and thematic food bring added fun and whimsy to the party. Bunny Candy Covered Oreos look complicated but are quite simple to make. Search the internet for one of the many tutorials. We used Pink Jelly Beans for the noses. Clear Cello Bags filled with cheese balls then wrapped with Green Curling Ribbon make for some adorable “carrots”. Use white candy melts to form bunny ears then set them into white iced cupcakes. Carrot shaped rice cereal treats? Of course! Offer real carrots to combat all the sweets, like pink marshmallows, bunny graham snacks, frosted cookies and Pink Gumballs. Pink Dot Treat Boxes get the bunny treatment with the simple addition of white craft pom poms. 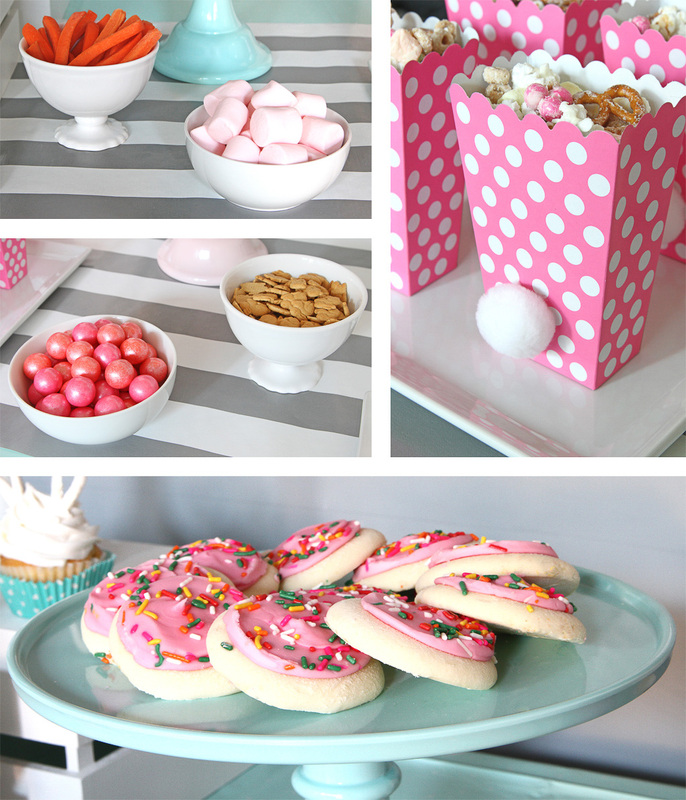 Fill boxes with a candy-coated popcorn mix, complimented by the addition of Pink Sixlets Candies. Bunnies love carrots so why not play a friendly game of Bunny Toss. 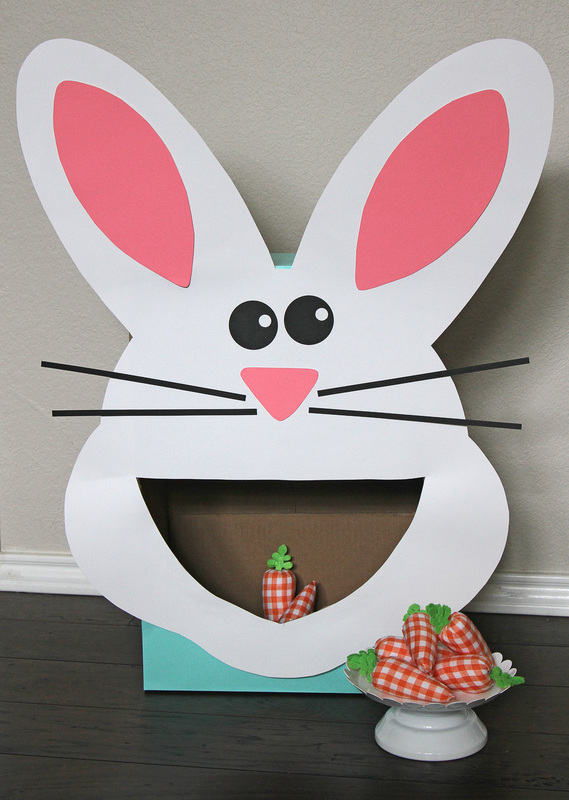 Construct this adorable wide mouth rabbit from a box, poster board and this template. We purchased our stuffed carrots from a local crafts store, but you could make your own from felt. The guest who feeds the bunny the most carrots wins! 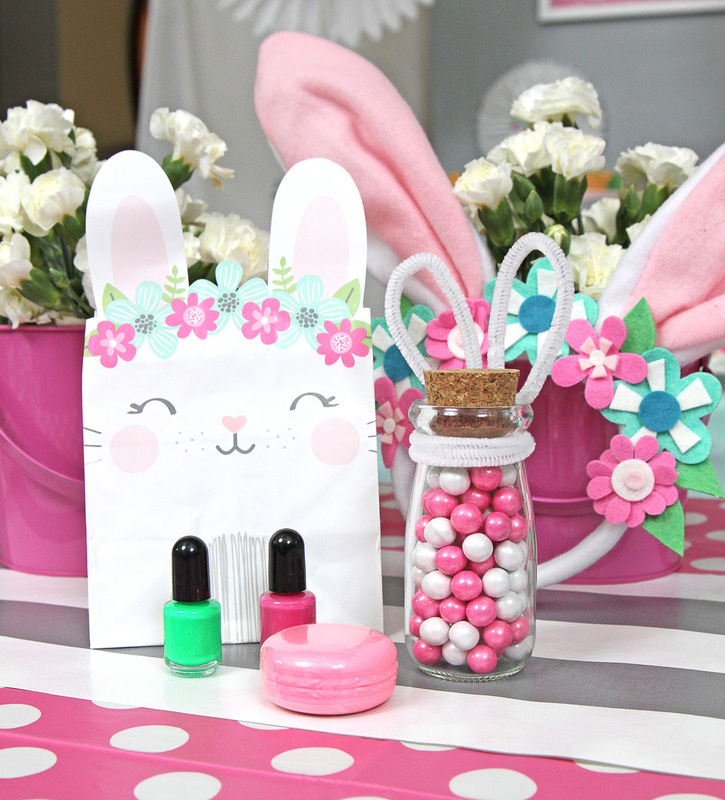 Fill Birthday Bunny Treat Bags with sweet and pretty accessories like Neon Nail Polish and Pink Macaroon Lip Gloss. Guests can also hop home with their Floral Bunny Ears and Bunny Candy Bottles too. A party this awesome might feel too good to be true. But like the fairytales, you and your little bunny will live hoppily ever after.